Emily starts first grade today! When she was in half-day kindergarten last year, she was home by 11 am and we got to spend the entire afternoon together. This year, she'll be having lunch with her friends in school. She's very excited and also a little sad that she's missing the company of her sisters (and maybe the Mother, too) at the meal table. "Write me a note, Mum." she said. "One for my school bag and one for my lunch bag." We have a silly private joke, the girls and I. They think squids are the funniest, slimiest, horridest-tasting things to put on pizza, or in a malt, or whatever. Whenever they ask what's for dinner, I say, "squid pizza" or "squidloaf". Whenever they ask where we're going for dinner, I say, "Squid Palace" or "Squidonalds". They think my favorite drink is squid juice. We say "stinky squid" when we're trying to get them to smile during a photoshoot. Ironically, I actually like squid. I ate a lot of it in Singapore, where they do marvelous things with fresh seafood. Have you had inky black squid pasta? And barbecued squid? And squid stuffed with minced pork, spices, steamed and sliced? Nobody cooks squid here much, apart from deep fried calamari. Anyway, Emily will probably laugh out loud when she opens the wrapped-up squid, sitting next to her brownie in her bento box. And over the next few weeks, I think I'll toss a fish or three into her lunch bag. Maybe every Monday, to start her week with a giggle. 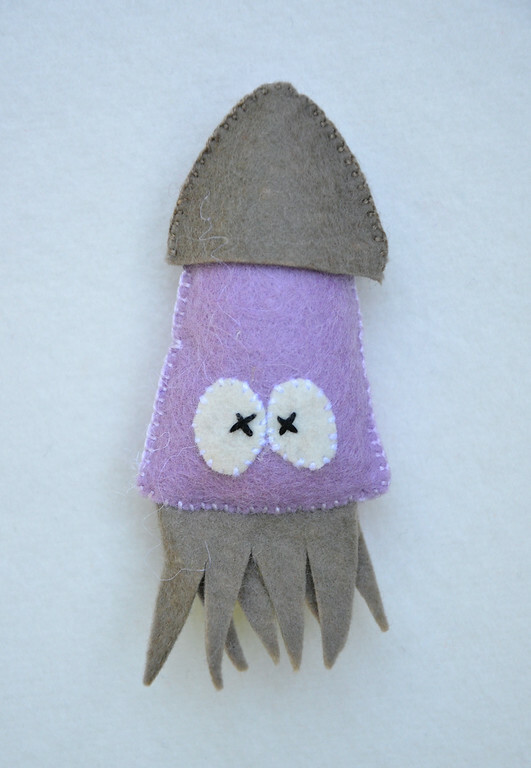 I cut out four different ones (including the squid) last week and hand-stitched them at night when the kids were asleep. by the matchless Terumi Otaka. This is from the 1980s, out of print, and now only available on ebay and etsy. There is page after page of little figures all through her book. Her creativity is amazing and her workmanship is impeccable. 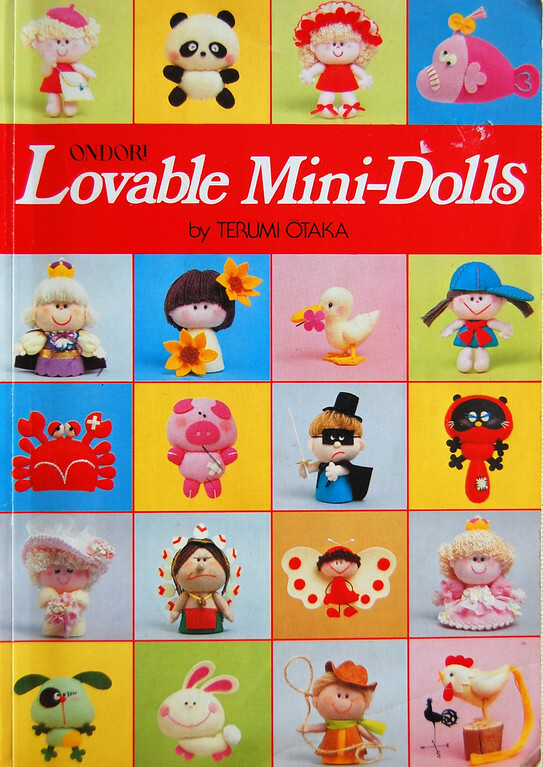 I think, just to relax and reward myself between serious sewing projects, I might work through this book and see how many of these little things I can make. The chapter on sea creatures alone made me die from cuteliciousness. But back to school. 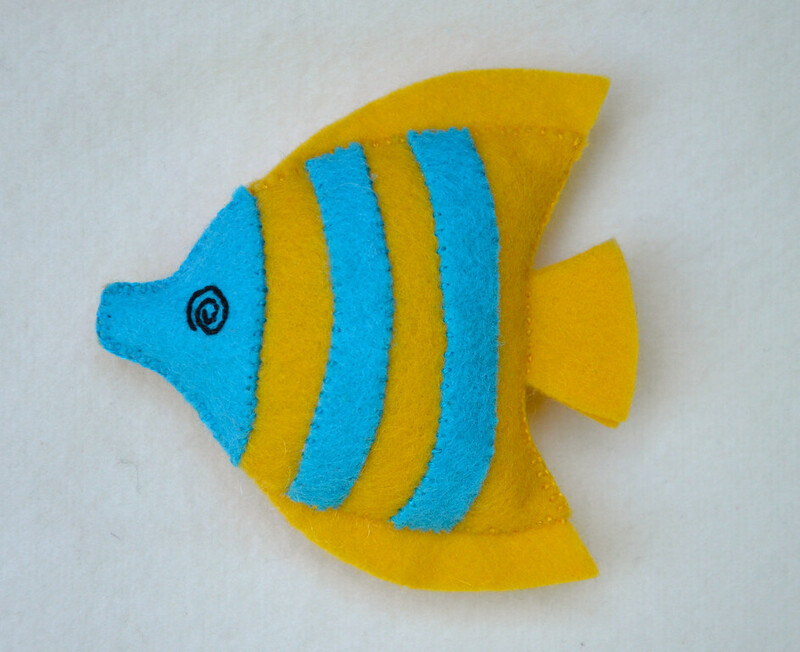 While sewing my fish for Emily, I suddenly remembered that I made many tiny felt toys like these when I was in elementary school. For my birthday one year - I think it was 4th? 5th? grade -, I made one for every single person in my class- and there were 40+ kids in our elementary school classes. They were just so much fun to sew. I had a few books like these back then, but this is the only one that I still have - I suspect they were thrown away by accident. So sad. 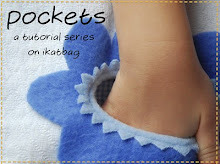 I wish I could share these patterns with you, because they are so easy and so addictive and so darned cute. But they aren't mine to publish in blogland, so you'll have to look at my photos and do the best you can with them. And now that Emily reads my blog (hurrah and bah), how to keep these a secret from her? Or any future handmade birthday/Christmas-present, for that matter? What a great story. I also love squid, but I have to admit it is a funny animal! The fishes ahd squid are adorable! 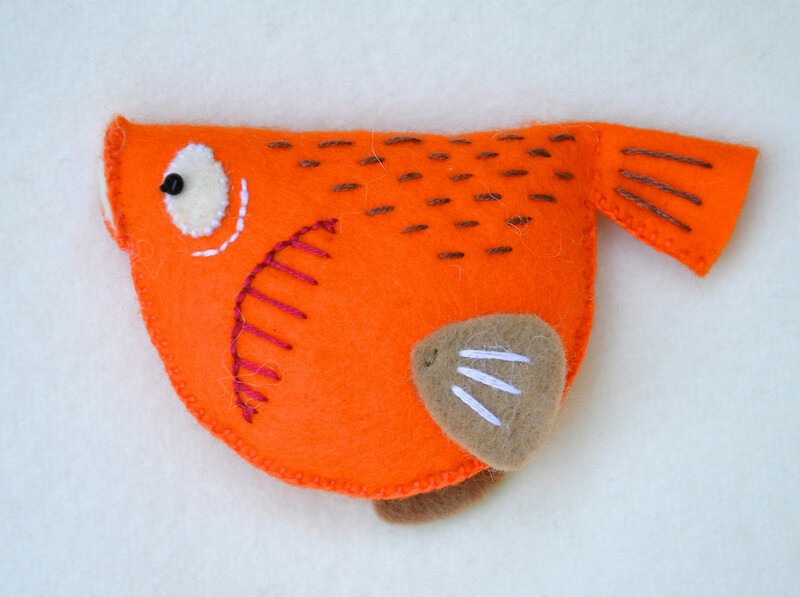 LiEr- I love love love these bright felt fish! I must try to find a copy of the book. This just brightened my morning! I also like the idea of having them in her lunch with regularity. Nothing to brighten up a mid-fall monday (when all the newness of school is gone) than a fabulous lunchbox fish!! 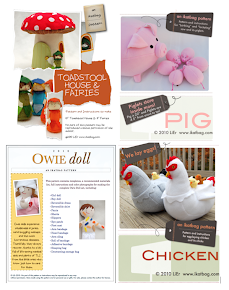 I used to sew wee felt toys as gifts, too! I have a Winnie the Pooh book with patterns that are meant to be enlarged, but I just cut the pieces out of felt and stitched them up. Miraculously, I still have the book, and I need to stitch together a few for the kids soon, especially Johnny who adores Pooh bear! These are so cute - if only my mum would put one in my lunch box - or even make me a packed lunch but at 34 I guess that's a bit optimistic! I agree..... these are a sweet way to brighten any Monday! These are v cute, I 'd laugh too if one turned up in my lunch box. Adorable fish! The book is also available at abebooks.com, kind of pricey, but available. Also try inter-library loan at your local library. I made some of those fish and sewed a paperclip to their mouths. I then crafted a fishing pole from a chopstick with a magnet on the end to make a nice little fishing game. I covered a small cake tin with a lid to keep it all together. That book has some very cool little critters in it and I intend to make them all. Mi nombre es Cecilia y soy de Argentina, espero que puedas traducir... es hermoso todo lo que haces ! hoy descubrí tu blog y quede impactada de todo lo que haces. Te felicito por que son ideas increíbles, me imagino el placer que te debe dar ver tus trabajos terminados y la alegría de tus hijas por todo lo que les das... gracias por compartir en este mundo de Internet tus trabajos!! yo también aprendí a coser por mi madre y estoy orgullosa de eso! Annie B: What a fabulous idea! 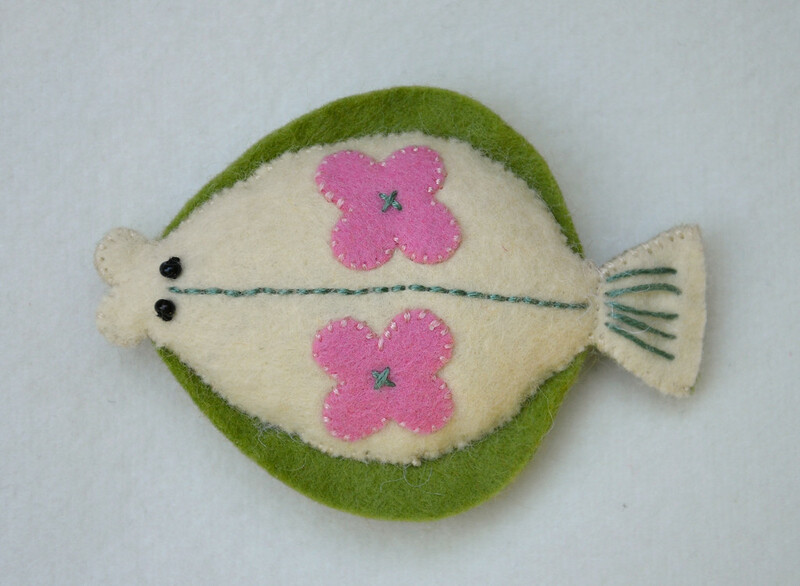 A felt fishing set! And a keep-em-together container, too! Would make a very nice gift for someone special! Love, love the fish! I am inspired to make tiny animals now! Where do you get your felt? love your blog! 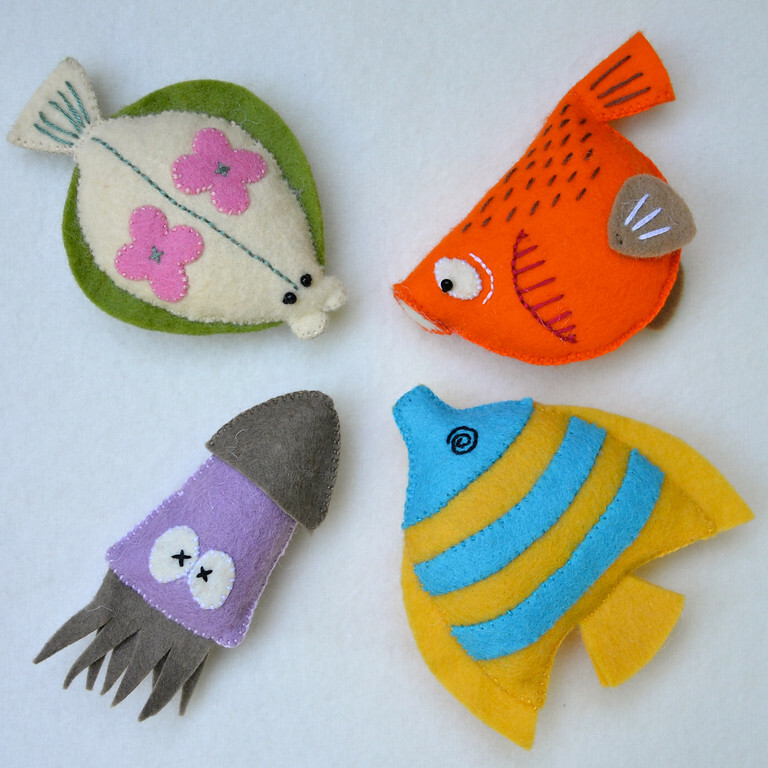 fab felt fish!! I just found your blog via Pinterest. I am looking for the book but I have a question is the book hard cover or paperback? I love your photos of the fish and your story. It seems like an easy project to do. Katie, it is a paperback.